I figured today would be the best day to share this review since it is in fact Pi day. Life of Pi is required reading for my English class, but I was glad that it made me pick up this book once and for all. I had been hesitant to read it since my mom and brother both had such differing opinions on this book, and I figured that, like my mom, this book just wouldn’t be for me. After finishing this book, I feel such a mix of emotions. Part of me appreciates the storytelling, another feels irked at the over-the-top philosophical thinking and religious elements, and still another has a love-hate relationship for the conclusion. 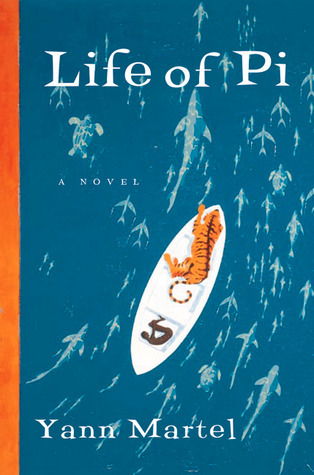 Life of Pi was harder to read than I expected due not only to its heavy religious messages but also the awful things Pi must do to survive. I really didn’t think it would get to me like it did, but there is only so much talk of butchering turtles I can take before I start feeling a bit queasy. As I’ve mentioned, the story is pretty well-written. I didn’t ever really feel that the pace dragged, and Martel does a great job of using imagery to tell this story that could have easily been much more drab. However, for those who have read the book, they will understand why the story was told with such care, which made me like the novel a bit less. It’s important to know upfront that the whole point of this book is to make you believe in God. That point is repeatedly pointed out several times. The biggest problem I had with this book was how things weren’t left for the reader to pick up on; instead, they are repeatedly pointed out with metaphor after metaphor. It felt like as soon as Martel said something remotely clever, he would point it out again and again to make sure no one missed out on what he was implying. Now, that ending! I knew there would be some twist at the end since my teacher told us that for a fact, but I didn’t see it coming like it did. I know I shouldn’t be surprised it took the direction it did, but still, it bothers me. I have to stop myself from saying anymore because I know I will ruin the ending for others. Have you guys read the book? What do you make of the ending? Beware: spoilers may be found in the comments. I gave up on The Girl of Fire and Thorns the first time I read it, but I wanted to give it a second chance. I quite enjoyed the story and characters so much more this time around. The first part of the novel moved slowly. While I would feel periods of boredom, the moments of action and suspense made up for it. Elisa did get on my nerves, but I could understand where she was coming from. I loved how she grew so much from the beginning to the end. The culture of the book is done really well. The people and their features and language are distinct and bring a certain detail to the book that sets it apart. I am reading the second book right now and oh my is it good. So much swoon. So much danger. So much love. I need the third book stat! The was the second time I read Mind Games, and I still found it just as clever as the first time. Mind Games has a crazy, female assassin as one of the main characters, which are some of my favorite to read about. Fia is a really enjoyable character in a warped sort of way. Fia is the definition of unpredictability, so there are lots of twists and turns to keep the book interesting. I have to say that I consider Annie as a secondary character, even though she is the other half of the novel’s narration. Fia’s story is the only one I am truly interested in, and it is also seems to be the true focus of the book. The secondary characters don’t see a lot of growth and they are all portrayed very simplistically and almost one-dimensionally. Part of this is due to the unreliable narration of both girls, but it still is something I would love to see improved in the sequel. The timeline of the narration doesn’t always make the most sense. It fits with the novels desperate energy and manic characters, but sometimes it was too hard to keep track of every story thread. Overall, Mind Games fascinated me with its wit and rough-around-the-edges characters. I really hope Perfect Lie lives up to and exceeds my expectations. This will be a different version of Condensed Reviews. I am reviewing the first three books in the Lux series, with a brief review for each, and more general comments after. If you would like to see how I have done some other Condensed Reviews in the past, take a look here and here. 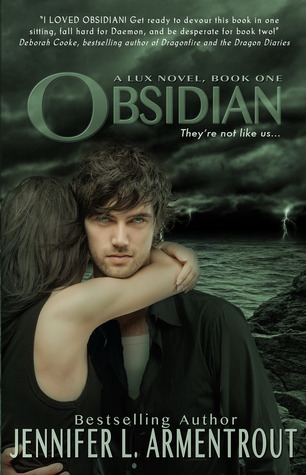 Obsidian is a pretty solid paranormal romance. It has a lot of PNR tropes like a jerk of a love interest. Obsidian has some unique elements that kept me entertained. I don’t do aliens, but I really liked the Luxen. Also, Katy, the aforementioned protagonist, stood up for herself a lot, especially against Daemon. I rooted for her and wanted to smack him. He made such chauvinistic comments, and while he started to redeem himself, the damage was pretty much done. I like Obsidian the best out of the three I’ve read so far. Onyx did not quite live up to my expectations. The characters made stupid decision after stupid decision. The magic of the first novel got lost somewhere. Katy, annoyingly called Kitten by Daemon, was so boring. In the middle of the novel I hit a wall where all action just stopped. It was the same events over and over. (I am being annoyingly vague about the details on purpose, I am just trying to keep these reviews spoiler free.) The last little bit of the novel brought the action, but only happened because Katy made the stupidest decision of stupid decisions. The bad guys were pretty spelled out, yet Katy completely missed the clues. I grew to like Daemon more and Katy less. In continuing with the tradition, Opal wasn’t better than than the novel before it. Do not read the synopses of these books because they are spoilery! Therefore, the ending was not a surprise to me. In all honesty the ending was predictable. The villain was obvious from the beginning. Katy and crew continued to ignore obvious signs. It was in some ways more exciting than Onyx, but then it too reached a wall of boring. At times, I had no problem setting this one aside. Does that above quote seem wrong to anyone else? Isn’t the saying “Easier said than done”? What am I missing here? Daemon and Katy were cute together. I loved reading their scenes. While they were sweet and my favorite part of the books, they could be a little irritating. The most annoying part of their relationship is how Daemon calls Katy pet names, like Kitten. He does it just about every sentence, which induced a lot of eye-rolling on my part. There was a constant battle between the two over “I don’t want you to get hurt” vs “I can take care of myself”. This argument was so repetitive. Katy has some unique traits. She runs a book blog, so some of her references were fun to read. I loved understanding her “insider” sayings. The only downside was that some of the references came across as forced. They seemed so unnatural or were out of place with what was going on. By the second and third book she does lose a lot of her originality. The villains of the novel could use more characterization. We hardly learn their backstory, and they are pointed out point blank. I think that if they get a little more development in the next installment, it will really help the story overall. I have included the following quote to better illustrate my point, but be warned it is a little spoilery. And before you think getting rid of me fixes this, you’re wrong. I have a message that will be delivered to her if anything happens to me… Yeah, I’ve thought of everything. To sum this all up, I would recommend the Lux series to paranormal readers. If you would like to try paranormal, Obsidian wouldn’t be a bad place to start. I know this review may seem a little critical, but I have enjoyed reading them. I plan on reading the fourth soon. The Shadow Society is unique in that I haven’t really read any other books that take place across multiple dimensions. I liked Darcy and enjoyed her friends, yet at one point her friends fall off the radar once Darcy gets wrapped up with Conn. It felt like a good majority of the books is just about Darcy and Conn doing not very exciting things. I appreciated how Darcy didn’t immediately forgive Conn when he betrays her. (I promise this is not a spoiler! It is written in the summary.) Conn was one moody character. He went through some personality changes throughout the whole book. Sometimes I couldn’t take him seriously. To be honest, I just sat laughing after reading that quote. He’s supposed to be some super tough guy, yet his actions don’t match that description. 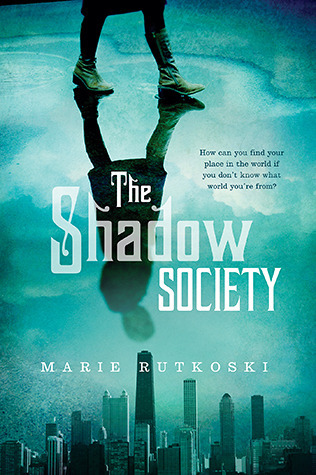 Overall, The Shadow Society is enjoyable, but not a book that I think I will be reading again. Despite not having an overwhelmingly positive experience with Rutkoski’s writing, I am still looking forward to her forthcoming book, The Winner’s Curse. Have you read The Shadow Society? Looking forward to The Winner’s Curse? Let me know! To learn more about condensed reviews visit my first condensed review post here. Set in 16th centrury Venice Cross My Heart is a historical novel full of murder and secrets. I had never heard of this book before, so I read it with no expectations. The writing is nice, the protagonist enjoyable, and the plot suspenseful. Despite its predictability and lack of character development, I liked Cross My Heart. 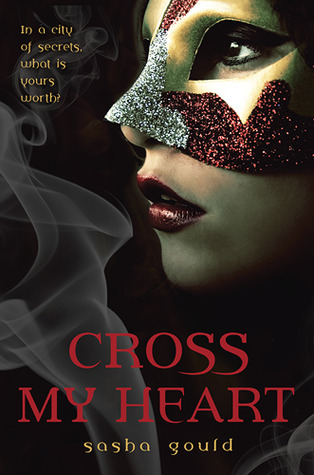 While I won’t be rushing out to get the sequel anytime soon, I would recommend Cross My Heart if you want a quick historical read, especially one set in Italy. Parts of this book greatly reminded me of Grave Mercy. Both characters deal in secrets and hail from a convent. Cross My Heart is Grave Mercy’s younger, less complex companion. Before finding this one in the library, I was completely unfamiliar with the S.A.S.S. series, but ever since I picked it up I have been seeing more and more of them. Nicole is a very annoying main character. 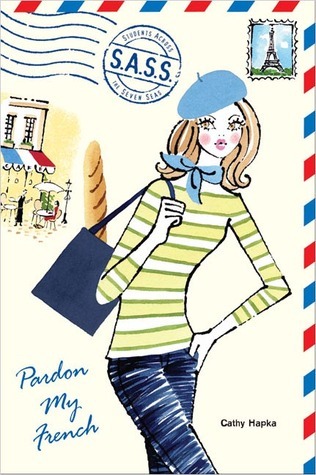 She constantly complains about studying in Paris. I could not at all understand her negativity. I’m a huge language lover and one of my biggest dreams is to study abroad. I wanted to shake Nicole until she realized how lucky she was. Paris, where the novel obviously takes place, didn’t really come alive on the page. In the beginning I thought there was potential, but the setting never amazed me. The series seems to be geared toward younger readers, which isn’t really my kind of thing. If I come across another S.A.S.S. book I might give it a chance, especially because each one is written by a different author, but if I don’t I won’t be disappointed. Condensed reviews are my version of quick reviews. The idea here is to review more books in a shorter amount of words to quickly convey my thoughts. The books featured in this style will be random and probably not a recent release. 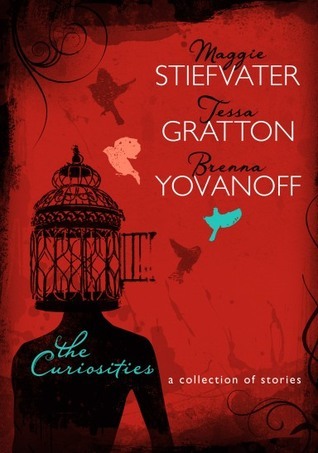 This is a unique collection of short stories written by Maggie Stiefvater, Tessa Gratton, and Brenna Yovanoff. Each story is annotated with doodles and comments from all of the authors. The stories are strange but highly original. I liked the short stories from Gratton the best, especially “Date with a Dragon Slayer”. Overall, the stories worked well together and were refreshing to read. Those looking for something unusual to read should try this one. I have grouped these two books together because I picked up Blood Magic after reading The Curiosities. I liked this one because of the sibling relationship between Silla, the main character, and her brother Reese. The writing is very cinematic, so much so that it is very easy to picture every scene like the set of a movie. Gratton is very good at always showing and never telling. 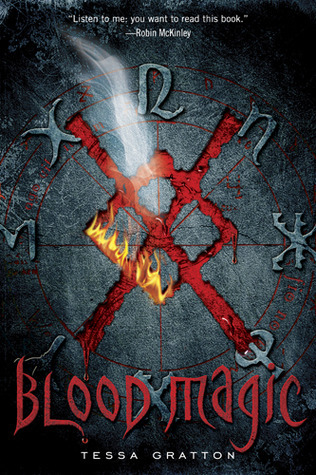 Blood Magic is worth checking out, if you’re looking to read a paranormal romance. Entering you email address below will allow you to follow the blog and get nifty notifications of new posts via email. ARC Tours and #LitLush Twitter chats!